Maple Leaf Farms, Inc. attended the Third China Waterfowl Development Conference in Wuhan, Hubei Province, China. The conference will focus on the duck industry in China and its current developments. The event is an opportunity for Maple Leaf Farms to share some of its research results and recent successes in applications around the world, and to continue building relationships with major Chinese duck companies. Maple Leaf Farms will also be promoting the INDUX® System while at the conference. Maple Leaf Farms cares about its ducks and their well-being. As an industry leader, the company has developed and implemented a comprehensive animal welfare program to ensure a healthy environment for its ducks. The program includes science-based duck care and handling for all stages of production, a training program for staff and growers, and an internal and third-party audit system. The company was the first duck company in North America to implement such a program. The original duck-well being program has now has evolved into a Trident Stewardship Program. Through this stewardship program, Maple Leaf Farms and the farmers it partners with focus on three key areas that contribute to welfare of the animals, the safety of its food products, and the success of its operations: duck well-being, biosecurity (disease prevention), and natural resources conservation. Maple Leaf Farms work closely with an advisory group made up of a number of leading animal welfare specialists, poultry scientists, and veterinarians in the United States to ensure that the these programs are followed and remain leading-edge. These professionals provide valuable feedback on how the company can improve the program and suggest areas for further research. Local and celebrity chefs often prepare duck at big events for Maple Leaf Farms. 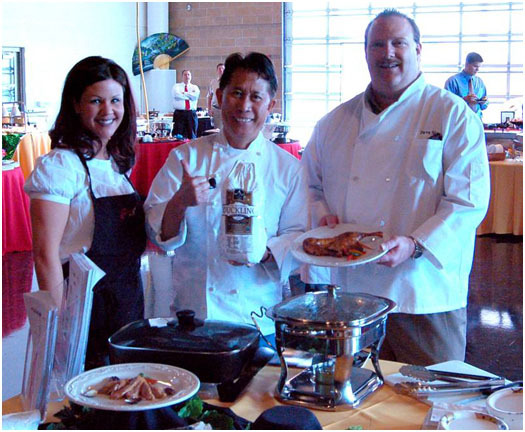 Chef Martin Yan (pictured center) holds a Maple Leaf Farms whole duck.